Most individuals file either a Chapter 7 or Chapter 13 bankruptcy. A Chapter 7 is a liquidation of assets. However, even though you're liquidating, you're still allowed to keep certain assets -- known as exemptions -- to give you a fresh start. These assets are limited in scope and value -- and include a certain amount of equity in your home and vehicle. If you have any nonexempt assets, such as stocks or a second home, they are sold to pay your creditors. Once all your nonexempt assets are gone, you receive a discharge of your remaining dischargeable debts. Debts that you cannot discharge include student loans, tax debt and child custody payments. In a Chapter 13 bankruptcy, you pay back part or all of your debt in a repayment plan; the value of your nonexempt property affects the size of your monthly payments. Once you complete your repayment plan, you receive a discharge of any remaining dischargeable debts. You must tell the truth throughout the bankruptcy process. When you first file for bankruptcy, you must sign forms to affirm that all the information you provided is true and complete. Later, the trustee, who is the court-appointed individual who is charged with the administration of the bankruptcy, will question you under oath. You have a duty to inform the trustee of any significant financial changes like an inheritance. You must report your inheritance when you become aware of it; for example, if your grandmother dies while your discharge is pending, you must report the inheritance even if you won’t receive the property for a year or longer. When filing for bankruptcy, you must disclose all your income and assets in your bankruptcy petition, as well as in several other forms that you must complete. The trustee will examine your documents for any irregularities that might indicate fraud, such as hiding an inheritance. Anyone else can notify the trustee about your inheritance, including creditors, a former business partner, an employee or even your ex-spouse. The bankruptcy court can penalize you for not revealing your inheritance. If your case is pending when you’re caught, the court can deny you a discharge of your debts. That means you still owe all your debts -- and can never refile for bankruptcy protection from those debts. If the court has already granted you a bankruptcy discharge, a creditor or anyone else has one year to notify the court of your inheritance. The court can revoke your discharge, which has the same effect as denying a discharge. The trustee also can report you to the FBI for a criminal investigation for fraud or perjury. This could result in a sentence of five years in federal prison and a fine up to $250,000. If you do the right thing and tell the trustee about your inheritance, the court will treat it like your other property. In a Chapter 7 bankruptcy, if you receive an inheritance within 180 days after you filed, it will go to the trustee to pay off your creditors. If its value is relatively small, it might be exempt. If it’s large, you may be able to pay off your debts without bankruptcy. However, if you inherit more than six more months after you file for Chapter 7, you likely can keep the inheritance, no matter how large it is. If you inherit while you are paying off your debt in a Chapter 13 bankruptcy, the trustee may decide that you must apply your excess funds or property to your payment plan, using it to repay your creditors. Bankruptcy Law Network: Perjury in a Bankruptcy Case Can Land You in Jail! 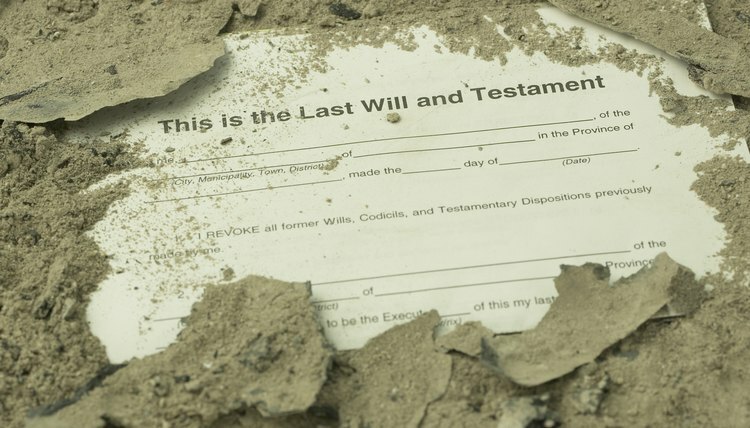 Bankruptcy Law Network What Happens if I Inherit Property While I’m In Bankruptcy? Debtors often believe that when they receive a bankruptcy discharge, their case is over, but this isn't always true. Your bankruptcy case remains open, and the trustee can reach your property indefinitely until he either abandons the particular asset or files a no-asset report with the court. Bankruptcy rules concerning the discharge of federal income tax debt are different depending on whether you file under Chapter 7 or Chapter 13. Because Chapter 13 is designed for debtors who have the ability to repay their debts over time, your will probably have to pay at least some of your outstanding tax debt. Can You Inherit Money After Declaring Bankruptcy?